With this software, you can simulate transmission attenuation amount of multilayer plate (max. 4layers) by using permittivity (εr' ) and permeability (μr') ! You can set angles of incidence, TM and TE wave. It is optimal simulation software for making designs of emblems !! 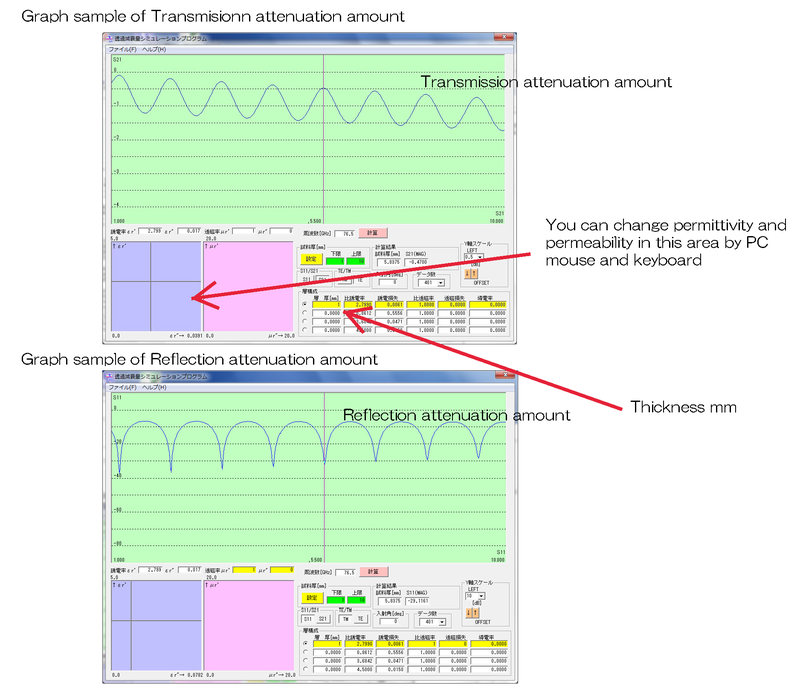 This is a simulation software of transmission attenuation and reflection attenuation amount to make designs of emblems etc.. By setting permittivity and/or permeability of the materials which you will use, it graphs the relation of thickness of material and transmission / reflection attenuation amount in real-time. A horizontal axis of the graph shows thickness of material, a vertical axis - attenuation amount. * when an angle of incidence is except vertical, permittivity is shown as an effective dielectric constant. You can find an optimum thickness with this simulation software. Thickness and attenuation amount are showed by graph in real-time, so it is easy to make desired combination of them. You can freely change permittivity and permeability in an only area by PC mouse and keyboard. It is possible to do simulation of multi physical layers (max. 4layers). You can change angles of incidencce of electromagnetic wave. It is possible to simulate angle characteristics with 2patterns of TM and TE. 1. This is a software for simulations of transmission attenuation amount of multilayer plate samples. 2. By changing real part and imaginary part of permittivity and permeability, it shows graph display with horizontal axis - sample thickness [mm], a vertical axis - attenuation amount [dB]. 3. To change real part and imaginary part of permittivity and permeability of selected 1 layer, PC mouse and cursor are used. 4. It is possible to simulate 4 layers maximum, but during changing 1 layer, other layers are fixed. 5. When putting a cursor on a graph, then the sample thickness and attenuation amount of the point are shown in a flame of calculation result. 6. It is possible to change incidence of electromagnetic wave freely(0° : vertical, -90° ~ + 90°). At the moment, it also possible to do simulations of angle characteristics by 2patterns of TM and TE. 7. Points of calculating data can be selected from 101, 201, 401, 801. 8. There is an entry of storage in file menu, it is possible to sotre simulation data by csv file format. 9. Number of frequency to simulate is 1 and it is selected by [GHz]unit.